There are 18 Memory Care Facilities in the Cary area, with 7 in Cary and 11 nearby. The average cost of memory care in Cary is $5,409 per month. This is higher than the national median of $4,650. Cheaper nearby regions include Raleigh with an average starting cost of $4,482. To help you with your search, browse the 21 reviews below for memory care facilities in Cary. On average, consumers rate memory care in Cary 4.6 out of 5 stars. Better rated regions include Durham with an average rating of 4.8 out of 5 stars. Caring.com has helped thousands of families find high-quality senior care. To speak with one of our Family Advisors about memory care options and costs in Cary, call (855) 863-8283. Cary is a town of 165,904 people in the heart of the Triangle area of North Carolina with a senior population of about 17,585. This region has been ranked among the top places to retire in the United States and boasts seven memory care facilities for seniors with Alzheimer’s and other types of dementia. There are 19 more facilities nearby in Raleigh, Apex, Chapel Hill, Fuquay Varina and Durham. Cary, as with the rest of North Carolina, offers two types of memory care facilities that serve seniors with dementia. The Division of Health Service Regulation licenses these facilities based on occupancy: facilities that serve two to six residents are called family care homes, and facilities that serve seven or more residents are called adult care homes. Both may provide hospice and home health care services directly or through third-party providers. This small Wake County town is ranked as one of the top 20 safest cities in the country, which makes it an ideal place for seniors to live. The Cary violent crime rate is scored at 21.1, 10 points lower than the national average, and property crime is scored at 23.1, 15 points lower than the national average. Cary is home to world-class medical facilities, including those specializing in brain health and dementia care such as REX Healthcare of Cary, as well as WakeMed Cary Hospital in the event of medical emergencies or illness. Cary’s year-round climate is generally mild. On a scale from one to 100, where higher scores indicate more days annually with temperatures between 70 and 80 degrees Fahrenheit, Cary scores a 63. However, temperatures can drop to 30 degrees in January and July can see highs of 89 degrees. It is a good idea to ask your chosen memory care facility how they ensure that residents do not wander out in extreme weather. Cary’s high quality of living comes with a substantial price tag. This town’s cost of living is scored at 127.1, almost 1.3 times higher than the national average, although this is mostly due to the cost of housing. However, North Carolinians are not taxed on their Social Security retirement benefits and other types of retirement income are modestly taxed. This may help families put more money toward memory care. Memory Care costs in Cary start around $5,409 per month on average, while the nationwide average cost of memory care is $4,799 per month. It’s important to note that memory care rates in Cary and the surrounding suburbs can vary widely based on factors such as location, the level of care needed, apartment size and the types of amenities offered at each community. 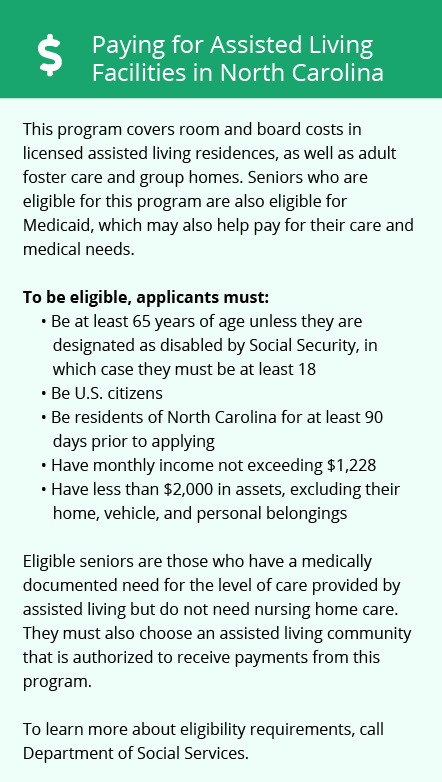 Cary and the surrounding area are home to numerous government agencies and non-profit organizations offering help for seniors searching for or currently residing in an assisted living community. These organizations can also provide assistance in a number of other eldercare services such as geriatric care management, elder law advice, estate planning, finding home care and health and wellness programs. To see a list of free memory care resources in Cary, please visit our Assisted Living in North Carolina page. 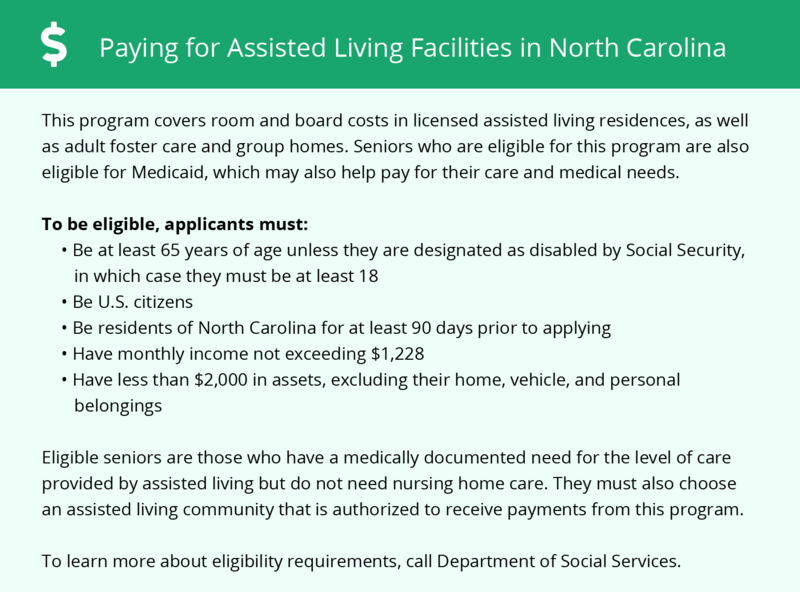 Cary-area assisted living communities must adhere to the comprehensive set of state laws and regulations that all assisted living communities in North Carolina are required to follow. Visit our Memory Care in North Carolina page for more information about these laws.